The center is only open during courses. Visitors are NOT allowed to enter the center, and if its an emergency you may contact the Vipassana Administrator. Only registered students, servers and teachers of that course may enter. 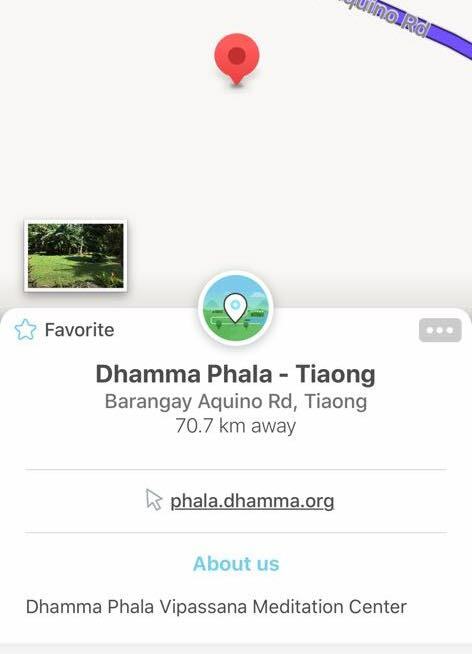 Search "DHAMMA PHALA - TIAONG" in Waze. Take a Lucena bound bus at any of three bus lines: JAC, DLTB and JAM. All three bus terminals are located in the area of Buendia, corner Taft Avenue, Manila. From here, the trip to Tiaong City will cost under 150 pesos. FYI, these bus lines also have terminals in Cubao, Quezon City. But the trips are not as regular. Then through San Pablo, Laguna Province. At Tiaong, Quezon Province, the bus will be making a left at the Total Gas Station to continue on to Lucena Province. Get off the bus at this Total gas station. Across the street from the Total Gas station is a tricycle line. Please take your first tricycle ride only from here. Ask the driver to take you to Bagong Palengke (30 pesos). At the Bagong Palengke, ONLY take the tricycle from the TODA Banginan tricycle queue. This tricycle will take you directly to Dhamma Phala in Barangay San Pedro, for 150 pesos. Tricycles from other queues may charge more than 150 pesos. If you are with a group of two or three, you can share the fare. The Dhamma Center, in San Pedro, will be the big property to your left. From SLEX, continue going south via the STAR Expressway. Take LEVISTE/BALETE Exit and turn LEFT on BALETE RD. Turn RIGHT on JP LAUREL Highway (CALTEX Gas Station). Turn RIGHT on LIPA – ALAMINOS BYPASS RD. Turn RIGHT on MAHARLIKA HIGHWAY. Take this road all the way to Tiaong. After the market in Tiaong, turn RIGHT after BANKO KABAYAN. Turn RIGHT when you see the marker for BRGY SAN PEDRO, etc. Take this all the way to Dhamma Phala, (formerly Manalo’s farm).